A full team of top quality garage builders in Calgary with real workforce and garage construction specialists. We employ trade specific people, not “jack of all trades”. This is what sets us apart from others offering these services. The assurance we place into giving top quality materials and cutting edge thoughts from the industry for all your garage building projects makes Abby Renovations Ltd. the complete solution for all your requirements for garage construction in Calgary and surrounding areas. Our dedication to carefully focusing on every part of the garage construction procedure allows us to fulfill each project from start to finish with cost effective pricing. 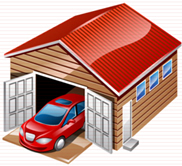 We will make a garage to fit your requirements at a price you can afford. Abby Renovations gives service to Calgary Alberta and surrounding areas including Airdrie, Cochrane, Strathmore and Okotoks. You can get all kinds of garage renovations from us at very discounted and affordable prices. In our constant effort to provide our customers an array of top quality exterior products to improve your outdoor living space, and be a real one-stop company for all your home requirements, we give excellent outside deck and fencing products. From cedar or pressure treated privacy fences to beautiful property gates – all at a reasonable price. We employ expert installers and forged relationships with top quality suppliers to give you products that will improve your property visually and functionally. Our team can help you build a deck that is ideal for entertaining and relaxing. Our team can assist you in choosing the perfect product for your new fence or deck. We also do aluminum and glass railing, vinyl decks, composite decks, and cedar decks. Abby Renovations Ltd. is here to help you through the way of designing & building your basement from beginning to end. We give a single point of contact throughout the entire plan to efficiently assist with the completion of your basement development in Calgary. We also specialize in secondary suites and know the ever changing codes and rules the city has put in place. We can convert your existing illegal suite into a legal secondary suite with very affordable pricing. All households in Calgary will have to make their rental suites into legal secondary suites by June 2020 or face heavy fines and or risk being shut down. We have our own group of well-informed engineers/architects, carpenters, electricians, plumbers, etc. with whom we work extremely closely to build the basement of your dreams. We are on-site each day ensuring the full design is translated properly and the best quality work is finished on time and within the plan. Our team of experts is dedicated to providing you the solutions to any roofing project. Our prices are very reasonable and we stand by our work. We can handle everything from small repairs, new roofs and re-roofs. Abby Renovations’ experience will allow you to relax during this process whether it is a complete roof replacement or a new construction. Abby Renovations has accounts with all the major suppliers which means we can provide you with a wide variety of roofing products, brands and styles to fit your needs and budget. We also handle insurance related jobs. The siding of your home is a very vital feature when it comes to first impressions; a spoiled or uneven exterior can cast a negative light over a property’s whole aesthetic! If you need new siding installed, or your exterior is in need of repair, give us a call for a free estimate. We also handle insurance jobs (hail, wind, etc.). We have accounts with all of the local suppliers, which means we can provide any type and color of siding available on the market. We can also provide ideas for cost effective upgrades to the exterior of your home and implement these ideas when doing your siding job. Abby Renovations Ltd. is a leading home improvement service provider across Calgary and surrounding areas. Our licensed and experienced technicians give all kinds of eavestrough services, including installation, repair, cleaning and maintenance. Insurance claims welcome. We honour insurance claims and non insurance repairs to residential exteriors including roofing, siding, eaves trough, soffit, fascia, windows, doors, etc.